During Social Work Month in March, the National Association of Social Workers (NASW) is beginning a conversation on how to raise the salaries of social workers. 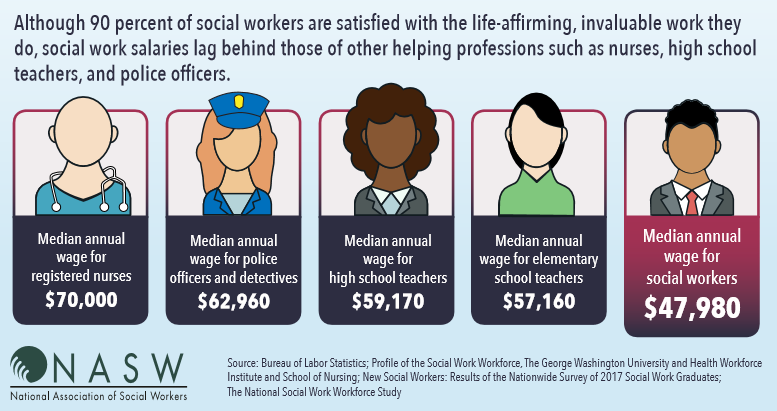 Despite social workers’ invaluable contributions, their salaries continue to lag behind those of other helping professions such as nurses, police and high school teachers, according to the Bureau of Labor of Statistics. In March 2019, NASW Social Work Talks podcast will feature social work experts who will talk about the salary issue, including factors that contribute to lower salaries and what can be done to address them. We invite you to listen to these conversations and leave your comments here. A new podcast episode will appear each Tuesday in March. Thank you for listening and for sharing your views on this important issue! Title protection is needed in all states. Also more focus from the NASW on building our profession instead of mainly focusing on social causes. Camft and other psychological advocates push for their professions first. The Social Work profession has not been good about developing its statement of value. It seems to range from “We take children away from their parents” to “I don’t know” to “It’s a very broad field, which you can do anything with”- that, to me, is the same thing as saying we do everything and nothing. As a starting point, I go with what a fellow attendee of a CEU workshop said of the social work- we are one of the only Master’s educated professions that holds itself accountable to leading towards equity, reducing discrimination, and promoting social justice. At a time when companies are recognizing the (actual monetary) value that diversity brings, we ought to be very competitive in the market. Similarly, there is a renewed appreciation for the concerns of underserved populations (immigrants, LGBTQ+, people struggling with addictions), and we ought to be at a premium in this environment. In the past, before I receive any pay raise as an employee, which has been a C.O.L.A. or a cost of living adjustment, I had to take on more job responsibility tasks in addition to doing an outstanding job with a positive evaluation and or take national or state competency exams. Additionally, also due to my own initiative I voluntary took on continuing education courses of interest including independent study versus the recent compelling forces of licensing board requirements which appreciatively sets a minimum uniform standard. This was an example of raising the standard. For years, I also was under the influence and training that to work in specialty jobs such as for example, a Clinical Psychiatric Social Worker, the minimum competence was a Masters degree which sets a minimum required top salary. Unlike nursing for example where you typically can receive a H.S. diploma and about two years or less of nursing education training to qualify to be called a Nurse LPN or take the national nurses exam to be called and registered as a US nurse or R.N. which is not a license. Nurses typically are found in one type of environmental setting and like other integral member of the health care team, raised their voice for improved salary. Social Workers are found in many diverse places such as health care facilities, school-education facilities, court legal settings, mental health care facilities, housing rehab, child protective services, family and children services, addiction treatments facilities, policy and civic services, philanthropy and charity, religious institutions to name a few. They also intersect and collaborate in a team approach in the care of service to others. Consequently, the public may not have a standard uniform definition of a Social Worker so their tasks, skills may translate only depending on their specific work settings and any of such tasks or skills could be a stand alone career. For this reason the salary may vary greatly depending on deviation from some of these factors. Its also a field dominated by the female gender in the direct service line. Its a serious concern because a lower salary has caused some single adults who are also taxed more to be employed with more than a single job to meet the escalating cost demands of modern society creating a over work time imbalance which could possible cause premature exhaustion. Finally, As salary rise due to standardized criteria, more men will seek the necessary credential to flock to that line or work which sardonically I say raises salary. I listened to the webinar and found Dr. Sinclair’s statements to be a good opening for this series. When discussing a marketing campaign, the profession needs to identify HOW it surpasses other helping professions to achieve superior outcomes. The problem is, the profession has failed to outperform because it has failed to measure, analyze and improve its interventions. If you are not measuring your practice fidelity, please know payer sources (including managed care and legislative bodies) are measuring accordingly. Another way to view this is marketing what is Value-Added in Social Work services. What is the customer willing to pay for? Is this service unique? Is the work being done right the first time or does it need re-work? The old way if touting our training and experience, without quantification, will do nothing to raise salaries. I believe it is vital that NASW continue the fight to increase social worker salaries. The teaching and nursing professions have managed to secure good salaries and form strong unions to advocate on their behalf. The social work profession does not get the recognition or compensation it deserves.We advocate for others but also need to advocate for ourselves. I live in New York where the cost of living is high and my social worker salary lags behind. It will be difficult to attract new workers to the profession and retain the workers we have if the salary issue is not adequately addressed. I believe this issue will need to begin with individual state licensing boards and private insurance companies. I applied for a position for a local crisis mobile response unit. As a masters level social worker, the pay range was $16-$18 an hour. For the licensed clinical social worker position, the pay range was $22-$24 an hour. For the registered nurse, with only a 2 year degree and license requirement, the pay started at $26 an hour. To be succinct, this is insanely unfair. To have gotten in significant debt to obtain the required graduate degree and still require 2 years of clinical supervision before even being eligible for licensure, delays social workers ability to advance in the profession. There is no reason why the educational and clinical training for social workers should equal that of a licensed advanced registered nurse practitioner (ARNP) or higher, but be paid less than an associates or even bachelors level registered nurse. I think that state licensing boards need to amend the licensing requirements, particularly in Florida, to allow for licensure sooner, particularly as students are required to have 2 years of clinical supervision as a graduate student, and then another 2 years afterward whereas nurse’s clinical rotations as a student count toward their licensure. Further, lobbying insurance companies to begin approving reimbursements to masters level providers would allow nonprofit social work agencies or private practices to hire masters level social workers at competitive rates, as they can recoup some of their salary via claim reimbursements. I have had my masters degree for over 6 months and have yet to receive a job offer making more than $38k a year. There’s something significantly wrong with that picture when a registered nurse can earn $50k or higher right after completing their two year program. I also live in Florida, and the salary ranges that I have been coming across are sometimes even below $30,000 for a bachelors (or even masters!) level social worker. It is disheartening. The job of state licensing boards is to protect the consumer from harm, not promote or regulate reimbursement rates. I am a former employee of a managed care company and can report the outcomes of clinical social workers were NO DIFFERENT from Mental Health Counselors, Marriage and Family Therapists and Psychologists. You can’t lobby for higher salaries without quantifiable supporting evidence. Nursing continues to advance their profession because they do this very well. We need to do it too. This feels like blaming the victim. We don’t have a collective bargaining force. We need a SW union. I agree that we need a PR campaign. SW are portrayed on TV and film but only as the “bad guy” either by taking children away from parents or leaving children with abusive parents. NASW needs to step up its game.